C’mon, you knew Ford wasn’t just going to sit back and let the Chevy Camaro ZL1 and Dodge Challenger Demon soak up all of the stock-market-fueled, tax-break enabled, empty-nester bonus cash laying around in America. Sure, Ford has the Mustang Shelby GT350 in its arsenal, a great car in its own right, and so far Fiat Chrysler and General Motors haven’t directly challenged the limited-production Ford GT exotic. In between those two impressive pieces of machinery, however, something was missing from FoMoCo’s lineup. At the 2019 North American International Auto Show, Ford unveiled the new 2020 Mustang Shelby GT500. This new car, the ultimate factory-tuned performance Mustang, does not replace the existing Shelby GT350. Rather, it slots in above, generating the kinds of numbers that matter when the beer flows and tall tales grow. You can’t miss the new Mustang Shelby GT500. 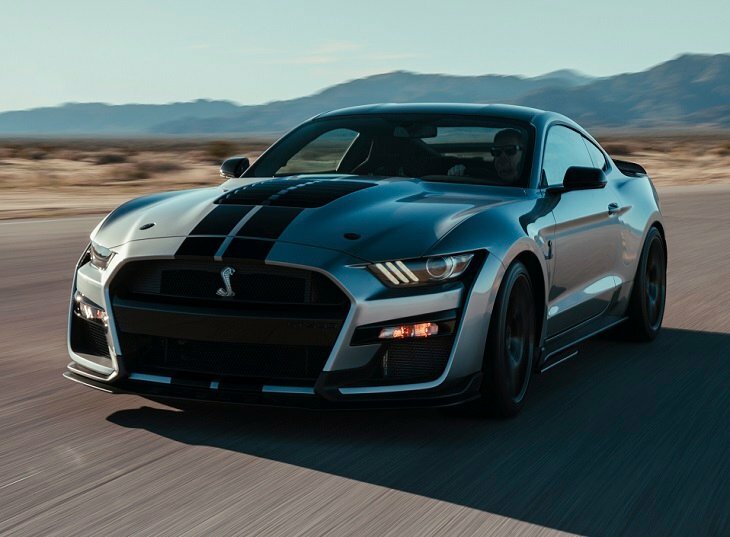 The front end is redesigned to improve cooling capability by 50% compared to the Shelby GT350, and one of those elements is a massive hood vent measuring 31 x 28 inches (six square feet!). The entire car is aero-tuned to maximize downforce at speed, and both hood pins and a performance decklid spoiler are standard. Down low, a new rear diffuser panel is made of upgraded composite materials. The optional Handling Package adds a swing spoiler with an available Gurney flap. The Carbon Fiber Track Package is what you want when nothing but the patented, exposed carbon fiber adjustable rear wing used in Mustang GT4 racing will do. Ford debuts new colors with the 2020 Mustang Shelby GT500, including Red Hot, Twister Orange, and Iconic Silver. Painted stripes are available as an option. Ford offered few details about the Mustang Shelby GT500’s interior. The standard seats are power adjustable and wrapped in Miko suede with accent stitching. Matching material decorates the door panel inserts. The Carbon Fiber Track Package equips the car with leather-wrapped Recaro racing seats with harness pass-throughs. This package also deletes the rear seat to save weight, and adds exposed carbon fiber trim on the instrument panel. Take one hand-built 5.2-liter V8 engine originally created for the Shelby GT350, bolt on a 2.65-liter supercharger with an air-to-liquid intercooler, invert it for improved charge-air cooling and a lower center of gravity, modify it for maximum oil circulation and cooling capacity, fortify it to handle a whole bunch more power, and you’ve got the Shelby GT500’s power plant. Individually signed by its builder, of course. The result, says the automaker, is the most powerful street-legal Ford in history. Horsepower measures more than 700, though a final figure is yet to be determined. To get all of that power from the engine to the ground, Ford uses a 7-speed dual-clutch automated manual transmission and a carbon fiber driveshaft. A rotary shifter, mounted to the center console, controls the transmission while paddle shifters facilitate manual gear changes. Drivers can choose to use the car in full automatic mode, semi-automatic mode, or full manual mode. Driving modes include Normal, Sport, Track, Drag, Slippery, and Weather. The Shelby GT500 also boasts both line-lock and launch control functions. The result is acceleration to 60 mph in about 3.5 seconds, according to Ford, and the GT500 screams through the quarter-mile in less than 11 seconds. It’s one thing to go fast. A car like the Mustang Shelby GT500 needs to stop and handle, too. To haul the Shelby GT500 down from speed, Ford installs 16.5-inch 2-piece vented front rotors and 6-piston fixed calipers. In back, 14.6-inch 2-piece vented rotors and fixed calipers handle stopping duties. Compared to the Shelby GT350, these components boast a 20% increase in swept surface area, and in front they’ll absorb 30% more thermal energy. Structural bracing, lightweighting, revised steering, and a next-generation MagneRide active suspension improve responsiveness, feel, and handling capabilities. With the Handling Package, owners can adjust the suspension for more negative camber when a weekend track day calls. Standard equipment includes 20 x 11-inch forged aluminum wheels with 305/30ZR20 Michelin Pilot Sport 4S tires. The Carbon Fiber Track Package swaps them out for staggered-width, exposed carbon fiber 20-inch wheels wrapped in Michelin Pilot Sport Cup 2 performance tires sized 305/30 in front and 315/30 in back. Both sets of tires feature custom, Ford-specific compound and tread. Capping off the performance hardware, the Shelby GT500 features a fully active stainless steel exhaust system with 5-inch polished tips. Volume and flow are dependent on which setting you select: Normal, Quiet, Sport, or Track. Ford equips the Shelby GT500 with a Sync 3 infotainment system. It has an 8-inch touchscreen display, SiriusXM satellite radio, and FordPass Connect services. Perhaps more important, it comes with Track Apps, which allows the GT500’s owner to capture data from their track-day adventures. Additionally, a 12-inch color LCD instrument cluster is standard, while a high-performance 12-speaker B&O Play premium sound system is available.